We just got back from a lovely trip down to Sand Hollow State Park in Southern Utah, just outside of Zion’s National Park. 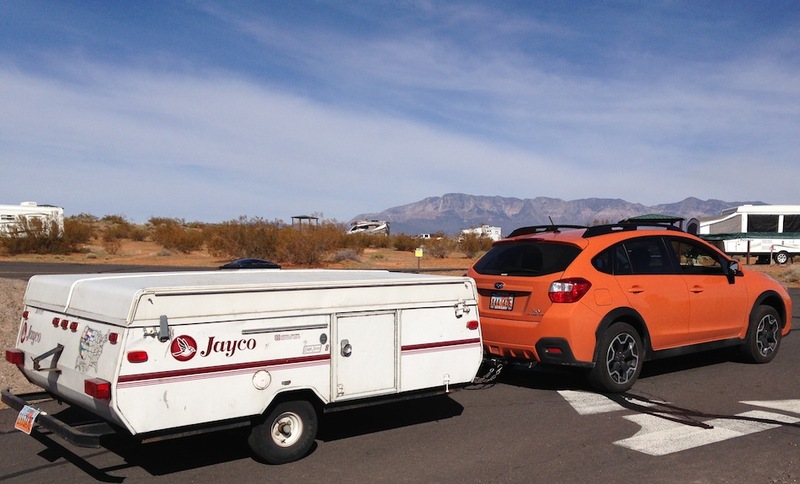 It was the first time we have camped with our trailer since we bought the Subaru XV Crosstrek and I have to say that towing with that car is a dream. This photo was taken on our way out of the Sand Hollow campground. It was a beautiful day and we had a lovely time camping in the middle of February. But the most interesting part of the story was how the Subaru was at towing. The towing capacity for the Subaru XV Crosstrek is 1500 lbs. in the U.S. Our 1995 Jayco Eagle 8 weighs 1090 lbs., so it easily falls under the max towing rating for this car. When we towed it with the Prius, we had several incidents where we had to slow down to get up a hill. It was never a problem, because we could tuck in behind a big diesel truck, but it did slow us down. With the Subaru, however, we were able to speed up all the hills at 65 mph, just like we hoped. We never overheated, had any problems with sway or even felt any pulling on the back from the trailer. The car handled like a dream. Best of all, our gas mileage was nearly identical to doing the drive without a trailer. Last time we drove that same route, we got 28 mpg. This time, we got just under 27 mpg. It was almost as if the trailer wasn’t there. We had some winds when we headed home and we didn’t feel the trailer pull at all. It’s similar to the experience of this guy, towing a Little Guy teardrop trailer with his XV Crosstrek. I don’t know how he’s getting 33.6 mpg on his car, but he didn’t notice a steep change in his gas mileage either. Ironically, we are getting about the same gas mileage from the Subaru XV while towing as we did with the Prius while towing, but without the huge slowdowns on the big hills. We were very pleased and can’t wait until we can go out and camp again. Hello, and thanks for the great write-up. Is that the Curt #13135 Class 3 on your Crosstrek by chance? Given the mounting situation I’m wary of overloading it, but if you did it with over 1000 lbs then I’m reassured. I have a 2006 Impreza with 186K miles and I have owned an Aliner Alite (looks similar to the camper in the picture but it is lighter) since about 2008. I have towed it many times since then to parks (100 to 300 miles). I never had any trouble towing the Aliner with the Impreza, even in hilly Allegheny State Forest, and as long as the gross weight of the trailer is under about 1200 pounds it should not be any problem at all with the Crosstrek. When I get the Impreza up to 200K I am going to get a Crosstrek, which is nothing but a somewhat souped up Impreza with road clearance, and of course I will fit it with the tow bar.